Can you hear the voices floating on the air? And words of each animal prayer. And have secrets they’re longing to share. But that doesn’t mean they’re not there. Pile it, pile it, pile it high. I don’t care, it rocks my world. And high atop a creamy shake. Topped with something whipped and creamy. The perfect food, without debate. Yes, give me whipped cream on my plate! The Poetry Friday Roundup is over at Hey, Jim Hill! (which is, unsurprisingly, the blog of author Jim Hill). Check it out, and then have a little whipped cream for yourself. I’m great at dodging raindrops. I love it when it pours. I must have dodged five thousand drops! Oh, sure... I’m soaking wet. But I didn’t try to dodge them all. I’m not quite that good. Over at The Happy Accident, I have an interview with fellow children's book author Eve Yohalem. Eve's been published by Chronicle and has a book of short stories out that she published independently. In the interview, we talk more about creating a platform and how Eve worked hard to create something that fits HER. I think this is really critical - we always hear "you gotta do this" or "do that!" but the reality is that each of us has different comfort levels, time available, and goals. I like the way Eve experimented to help herself, too. I hope you'll check out the interview. 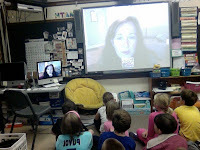 For more children's lit related interviews, check out the Interview Wednesday roundup over at the Teaching Authors blog. I left it at home. I did it last week! To me it was Greek. I don’t understand what it’s supposed to teach me and that wasn’t explained and I don’t learn anything when you give me a number grade or a check mark with no explanation of how to get better so the homework is a waste of my time and I didn’t do it because I hate it. Today's poem was inspired by the poetry prompt over at The Miss Rumphius Effect. It might've also been inspired by some real-life observation, too, and it's quite clearly from a student POV! This shirt is great - the best I’ve worn. And when I stretch my belly’s showing? Are gone (though I know what they said). Each splotch contains a memory. I love this shirt with all my heart. I’ll wear it 'til it falls apart. To make it last for one more wearing. The Poetry Friday roundup is up over at the Wild Rose Reader. Check it out (and you might want to check out Elaine's whole blog while you're there, too, if you're a poetry fan). And those of you who know me and are gonna ask... no, I can't pick just ONE favorite shirt of my own. 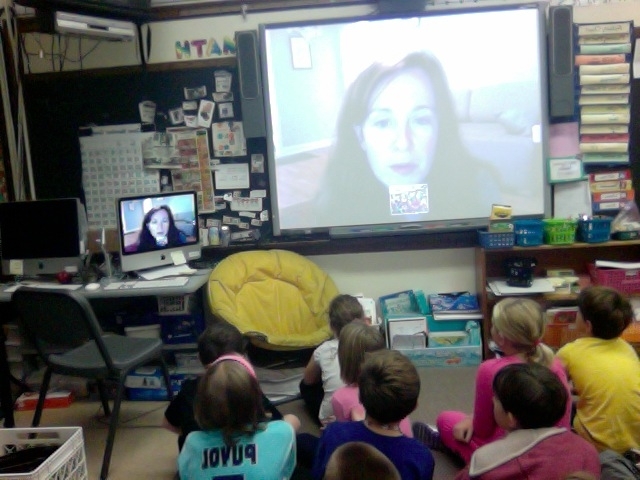 Over at The Happy Accident, I have an interview with author Laurel Snyder about her doing 100 Skype class visits in 100 Days. If you've ever thought about Skype visits or wondered about them or had a nutty idea like 100 in 100... you oughta go read it. And if you haven't... well, I still encourage you to go read it - Laurel's answers to my questions are really fabulous. Over on my other blog, The Happy Accident, I have a post up talking about both creating comment-worthy comment AND the "art" of adding comments, too. There's a fine conversation going on in, you guessed it, the comments of the post. I'd love you to head on over and add your thoughts, too. You see? You’re still here. The 13th is a terrible tease. Relaxed as a bird on the breeze. Yet truly, it doesn’t annoy me. 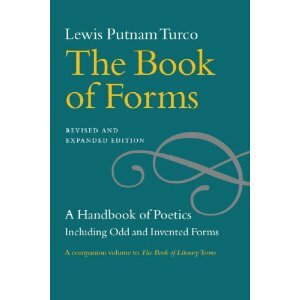 I just got a copy of Lewis Turco's revised and expanded editions of The Book of Forms. 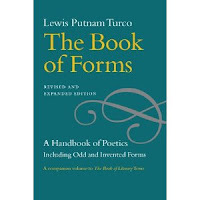 It includes odd and invented forms (including me and The Fib on page 214! ), and, I gotta say I could read it all night long. So many forms, so little time! Anyone have a favorite quirky form? Feel free to leave it in the comments or send me off to it in the Book of Forms itself. So many of these I'd never heard of, and I'm sure I'm missing some great ones. Doesn't this seem like a picture book waiting to happen? I just saw this story of a man whose slipper order came in size 1450 instead of 14.50 (whoever it was who shared it recently on Facebook, thank you), and it struck me that it's like a mix of Clifford and Where the Wild Things Are and... oh, I dunno. It just made me smile, I guess. Regardless, that's one big slipper! Draw or paint a day away. Film a movie all night long. I had so many different titles for this one that I think they could make a "list" poem all by themselves.... To see how others are kicking off this year in poetry, head on over to Teaching Authors for the first Poetry Friday roundup of the year. Not enough children's literature related excitement for you? Well, then, the Cybils finalists have been announced. Fantastic books in there in all sorts of categories (and good apps, too), and I'm actually quite relieved not to be a judge this year having to make final decisions. Resolve to break one really quick. You’re guaranteed of keeping one. Happy New Year! May you keep all your resolutions (unless, of course, you resolve to break one, in which case you'll either break that resolution or another one or... oh... never mind. ).